I don't usually venture out to the southwestern part of Vancouver for sushi, so I asked my friend Tamsen who knows the area better for some advice. He suggested either Applause Japanese Restaurant or Sushi Mura. 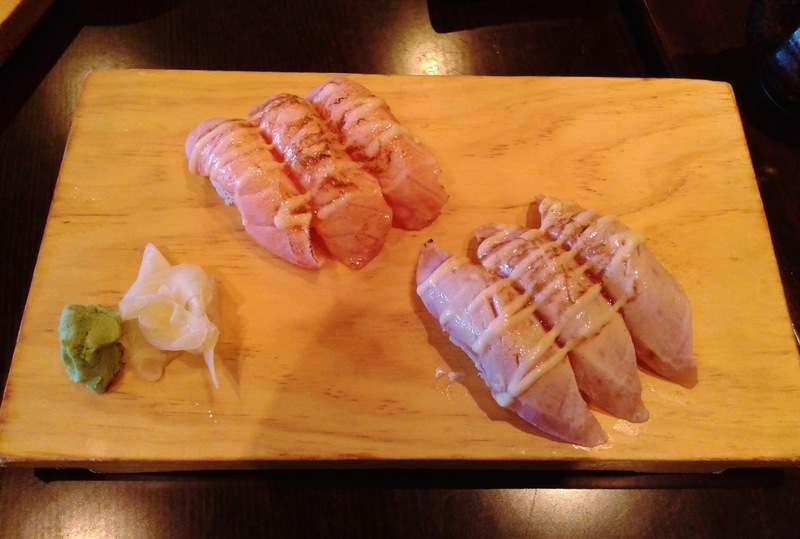 Since I had already been to Applause in the past, we eventually decided on Sushi Mura. I also brought my friend Katie along since she had just recently visited Japan and claimed to know her sushi. In order to avoid a line-up, I suggested having lunch at noon (this was on a Monday), and the restaurant was only a quarter full when I arrived. 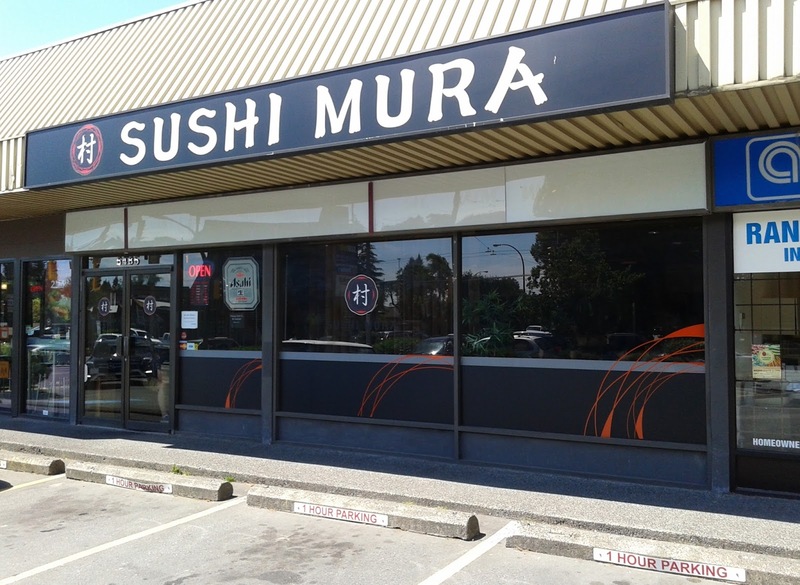 With a seating layout like Sushi Garden and a menu like Sushi Town, Sushi Mura is one of the most popular places for affordable sushi on the south side of Vancouver. 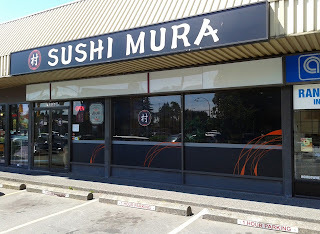 Like Sushi Garden and Sushi Town, Sushi Mura is Korean-operated. Katie's favourite Japanese food is Salmon Sashimi, so we made sure to get her both kinds (the Atlantic kind and the Wild Sockeye kind). 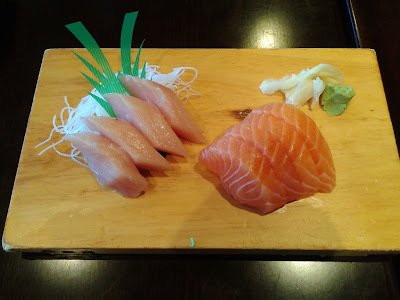 The first thing I had was the Salmon Sashimi, and I was quite pleasantly surprised by the amazing freshness and the clean cutting skills. It had a delicious buttery, sweet flavour and an excellent soft texture. The Tuna Sashimi was fresh and soft without any fishy aftertaste, though the knife skills here were less spectacular. I got my hopes up for a possibly phenomenal lunch! 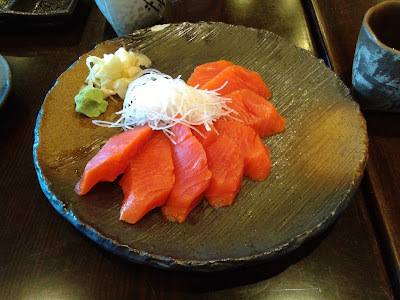 My hopes died when the next dish, the Wild Salmon Sashimi, arrived. It was lacking in flavour and was on the tougher side. The knife skills were abysmal, and there were loose bits and dangling pieces of salmon. I could have probably done a better job of cutting the sashimi with a pair of kids' scissors. Feeling awesome, I ordered the Awesome Roll, which consisted of crab, cucumber, avocado, mayonnaise, masago, salmon, green onion, bonito flakes, and special sauce. It was pretty much identical to the Awesome Roll at Sushi Town, except with a slightly neater presentation. 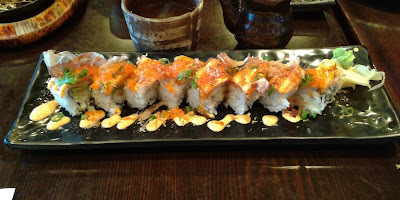 The slightly spicy mayonnaise gave the roll a well-harmonized creamy, sweet flavour. The fresh Atlantic salmon was finely showcased. The only issue was that all three of us had accidents while picking the pieces up. One of our accidents made a nice little splat on the floor. Whoops! The Seared Salmon Nigiri had a creamy seared taste while the natural flavour of the tuna was still quite evident in the Seared Tuna Nigiri. I liked how they added the mayonnaise and then seared that along with the salmon, as this often gives the nigiri a richer smoky flavour. I found the sushi rice a little too tightly packed, which distracted me from enjoying the soft textures of the fish on top. Katie doesn't eat tempura, but the Appetizer Tempura was only for $3.95 (the cheapest I have ever seen an Appetizer Tempura), so I couldn't resist the urge to order it. Tamsen was kind enough to split all the pieces with me so that I could write my own opinion of each. 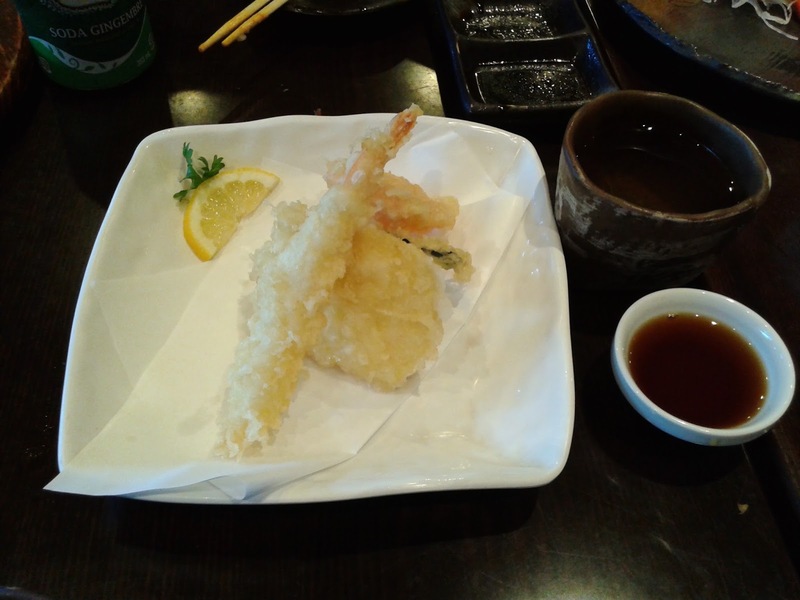 The Prawn Tempura was rich and savoury, the Yam Tempura was pleasantly soft and sweet, the Zucchini Tempura was as thin as a chip but still somewhat juicy, and the Sweet Potato Tempura was decent and sufficiently soft. I didn't have any issues with the batter as it had that light, sought-after crispiness and was not overly hard. Grilled on a hot iron plate, the Beef Teriyaki was tender and savoury with no overdose of teriyaki sauce. The bean sprouts had a tasty pan-seared flavour, and the rice that accompanied the teriyaki was also decent. All of our dishes arrived in a timely manner, though keep in mind that the restaurant was never extremely busy during our visit. The service was efficient, but it could be friendlier. The quality of the dishes wasn't entirely consistent, but there were more hits than misses. Given the price of the dishes, I was satisfied with the food, and so was Tamsen. Katie seemed to happy with all of the dishes she tried except for the Wild Salmon Sashimi. After leaving the restaurant quite full, I was ready to get obliterated by the sun once again.